In a modest, cozy Vacaville ranch house that smells of fresh herbs, powders and aromatic lotions, Juana Martinez sleeps. 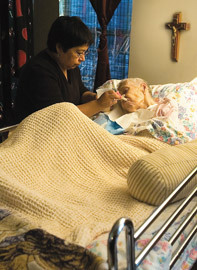 The 98-year old native of El Salvador has been bedridden for a number of years, and in her final chapter of life, has come to the home of her daughter Cecilia Vega. Vega’s dedication to her mother has been her main focus, almost without respite, for the past decade. Cecilia, 57, is the youngest daughter in her traditional Salvadorian family. As expected in her culture, she is the one who is designated to wash, feed, tend wounds and give constant care and comfort to her mother for as long as it takes. But now, breaking with tradition, she is receiving help. That help comes from NorthBay Hospice & Bereavement’s team of doctors, nurses and volunteers. Gently stroking her mother’s cropped hair, Cecilia tells stories about Juana’s life as a loving mother and gourmet cook in El Salvador. She remembers that the meals created and skillfully served were so wonderful that Juana worked for a wealthy family as their personal chef for a number of years. A photo taken of her mother over 70 years ago shows an exotic beauty, with high cheekbones, slightly almond-shaped eyes and a shiny cascade of caramel-colored hair. Cecilia says Juana was healthy and energetic well into her older years, always ready to cook her famous chili rellenos and gather the family together. Those days are, sadly, gone. Wertz adds that she hopes other women will do what Cecilia has done and find new ways they can accept much-needed help. “Most of the women of all cultures I talk with who are mothers say they are not raising their daughters to give up everything just to care for them at the end. They want them to have a freer life. We gently encourage them to think of themselves to be just as important to the family as their children are and to seek help from hospice when they want help caring for their loved ones at home. Many of them are surprised to learn that they or their loved ones don’t have to be a patient of NorthBay to receive our services—and it’s free.” For more information about NorthBay Hospice & Bereavement, call (707) 646-3575. Juana Martinez’s family members were recipients of NorthBay Hospice & Bereavement’s Dream of a Lifetime program that grants wishes of the terminally ill. For Juana’s dream, her family gathered at Cecilia’s home and were treated to a several-course, catered Salvadorian meal, similar to what their mother used to prepare. To find out more about this special program and its rules and guidelines, call (707) 646-3575.